For a long time I’ve been thinking about my a big part of my life that is ‘walking home’. It is more often than not on my own, in the dark, in cities. And I walk the line between being scared and being brave; feeling that politically it is an important action that I am reclaiming the streets, that being visible and counted out here might shift the way we think about who uses the space and how. (Also, it’s free). But I cannot escape the fear. And so do lots of my female friends. Many of us walk with our keys in our hands, tiny metal make-shift weapons. It says ‘I AM NEAR MY HOUSE’ or perhaps even more plainly, ‘DON’T EVEN TRY IT’. 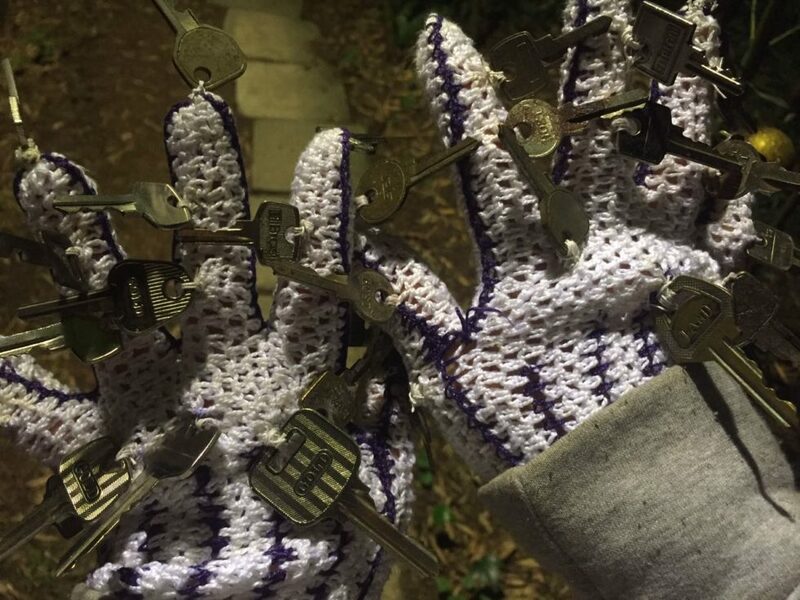 So I set about making these gloves, from old keys, that aim to protect and empower the wearer. They open doors. 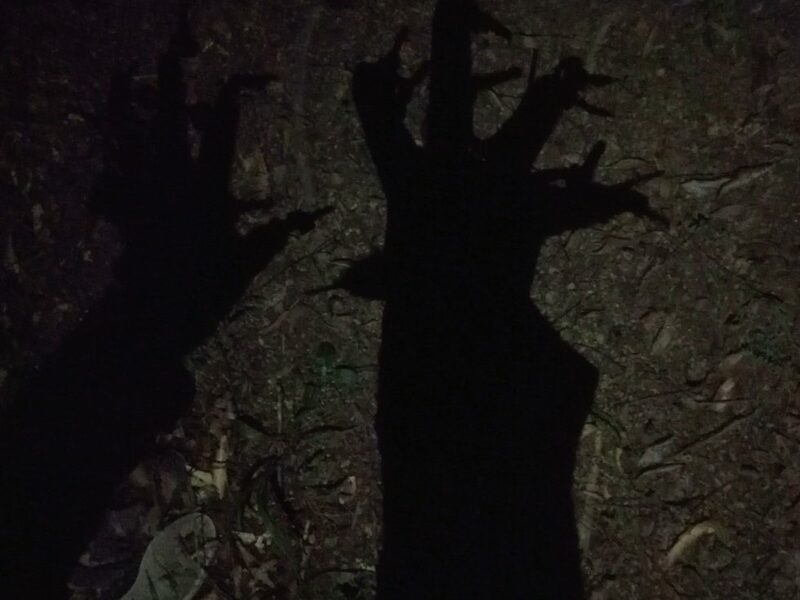 They turn your shadow into a monster. They are armour. They are available for hire, for you to walk at night as you please, in exchange for a copy of your front door key. Enquire within about for details. 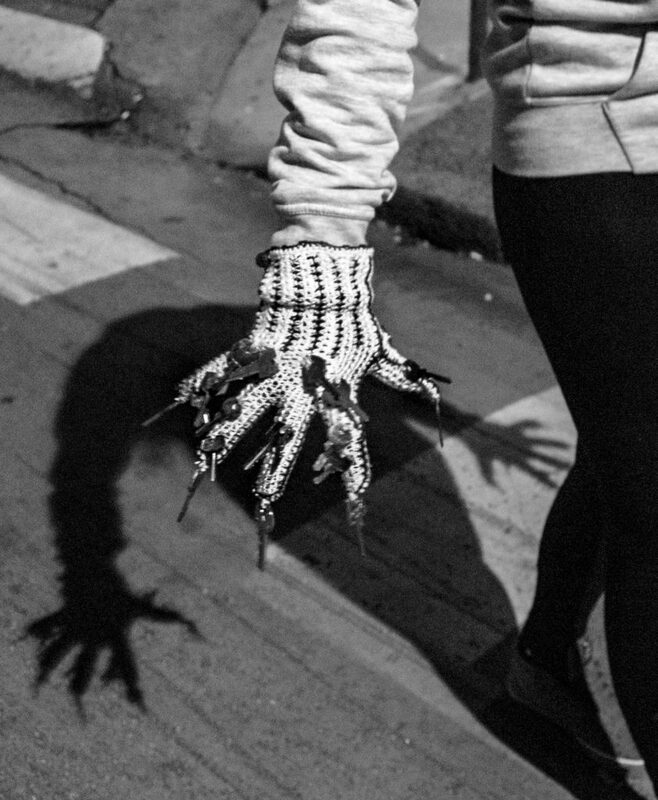 Currently, I am doing various nightwalks whilst wearing the gloves around São Paulo, Brazil. I’m thinking about women and danger, both acknowledging it and interrogating it. This is an ongoing project that I first developed in on my residency at Usina da Alegria Planetária, in June. Their artistic community is based in Cotia, in the forest their studio which has an abundance of materials, costumes, machines- the majority of which have been found, donated or dumped there. I set to work making various apparel for some new performances.